The Lion, the Witch and the Wardrobe by C. S. Lewis was the first book written in the seven Chronicles of Narnia. It was originally published in 1950, although the events in the book occur after The Magician's Nephew. Walt Disney and Walden Media adapted it for film 13 years ago. The story begins when four children: Peter, Susan, Edmund and Lucy are evacuated from London because of the Blitz during World War II. The house to which they are evacuated is very large and somewhat famous. On a rainy day, they explore the house and find a room with a wardrobe inside. The youngest, Lucy, goes in and finds a snowy wood and a Faun named Mr. Tumnus. The faun welcomes her to the land of Narnia and invites her to his house for tea. After serving tea, he lulls her asleep with the intention of handing her over to the White Witch. He changes his mind and in tears explains everything to Lucy. He helps her escape back to ‘Spare Oom’ and ‘War Drobe,’ countries he never studied in school. She rushes back into the house to find that no time has passed and none of her siblings believe her story. A few days later, Lucy and Edmund, her obnoxious brother, find Narnia separately by hiding in the wardrobe. Edmund meets the White Witch and is tempted by enchanted Turkish Delight into joining her side and agreeing to bring his brother and sisters to her castle next time. He meets up with Lucy in Narnia but then lies about it to Peter and Susan. Peter and Susan speak to the owner of the house, the Professor. He asks them to consider who is more likely to be telling the truth, Lucy or Edmund, and recommends that they avoid rejecting an unlikely proposition in favor of an unreliable reporter; he believes Lucy's story and recommends that they mind their own business. Not long later, all four children hide in the wardrobe to escape from a tour and find themselves in Narnia. They go to Mr. Tumnus' house to find it torn to pieces with a note that says he has been arrested for aiding Lucy. Then a talking animal called Mr. Beaver finds them and brings them to his beaver dam. After dinner, they discuss how to help Mr. Tumnus, and talk about Aslan. During the talk Edmund slips out and heads for the Witch's house to betray them. When they discover he is missing, Mr. Beaver realizes what has happened, and they immediately pack up and leave to find Aslan. Edmund arrives at the Witch's castle and becomes her hostage. She sends her wolves to find his family, while taking Edmund to head them off before they reach Aslan. The Beavers get the children to Aslan first, and Aslan arranges to have Edmund rescued. The White Witch arrives to claim the traitor as her right, and Aslan secretly arranges to die in his place. Aslan is ceremonially killed at the Stone Table, and the witch then takes her army to attack the children and Aslan’s allies. Aslan is resurrected the next morning, with Susan and Lucy present, and travels to the witch’s castle to restore all the animals she had turned to stone. Once restored, they join the battle in progress between the witch and Peter and their forces. Once he arrives, the battle quickly ends, the Witch is killed, and Narnia is freed from all of her magic. The four children are crowned as the new rulers of Narnia. After several years they stumble back into our world where they find that after all that no time has really passed. The British Broadcasting Corporation adapted it for television (along with Prince Caspian, The Voyage of the Dawn Treader and The Silver Chair.) It was also adapted by Walden Media for film. The cast includes William Moseley as Peter, Anna Popplewell as Susan, Scandar Keynes as Edmund and Georgie Henley as Lucy. Liam Neeson voiced Aslan. It was released in 2005 and sold successfully. 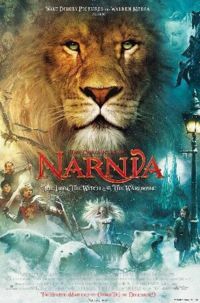 ↑ The Chronicles of Narnia, The Lion, the Witch and the Wardrobe Directed by Andrew Adamson, Produced by Mark Johnson, & Philip Steuer. ↑ The Lion, the Witch and the Wardrobe by C.S.Lewis, Macmillan publishing Company, 1970. ↑ The Lion, the Witch and the Wardrobe, Directed by Andrew Adamson, Produced by Mark Johnson and Philip Steuer. This page was last modified on 25 April 2017, at 09:30.